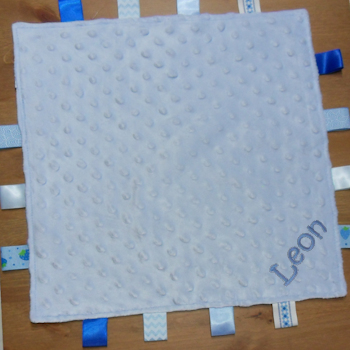 Tactile comforter blankie in baby blue with colourful ribbon taggies that is made special with a personalised name to one corner too. This cute little comfort blanket is well made and double sided with very shiny smooth satin reverse and a soft plush bumpy front featuring a pretty assortment of polyester ribbons along the edges. This comforter blanket, or sometimes called a taggy is fully machine washable. This cute little comfort blanket is well made and double sided with very shiny smooth satin reverse and a soft plush bumpy front featuring a pretty assortment of polyester ribbons along the edges. This comforter blanket, or sometimes called a taggy is fully machine washable. Made in Great Britain.